Temperatures in southern China heat up in June. It's also the beginning of the rainy season, which provides welcome relief from the sweltering humidity when it finally falls. We spent about 10 days in Guangxi Province in June, 2018. Even though the weather forecasted rain all day, every day, it actually only rained a few times. It did not deter us from any planned activities in the least. 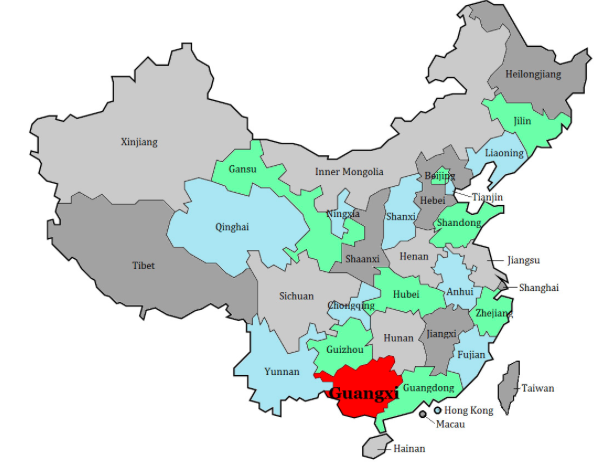 Guangxi Province is considered the "wild west" in China, an open expanse of mountainous karst-jungle terrain that remains largely untamed to this day. As the well-known saying goes in China, "East or West, Guilin landscape is best!" Tourists flock to Guilin and its surrounding attractions for a broad range of outdoor activities: hiking, rafting, cycling, mountaineering, swimming, and more. Guilin was our home base as we toured Yangshuo and Xingping and the 700 year old Longji rice terraces in Longshen.